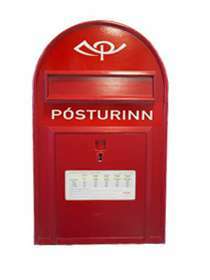 Íslandspóstur is the national postal service of Iceland. It dates back to the year 1776 when Christian VII, king of Denmark (and at the time also Iceland) ordered a mail service to be established in the country. Two years later, regular postal sailings begun between Iceland and Denmark, one a year. The first Icelandic postage stamps were published in 1873, and at the same time, the Icelandic postal system was being organised under a special board and the first post offices being established. In 1935, the postal service and the national telephone company were merged under the name Póstur og sími (Post and telephone). In 1998, that governmental company was split up into two companies, Landssími Íslands (the telephone company) and Íslandspóstur. Landsími Íslands has since been privatized. Íslandspóstur has one of the greatest numbers of employees in Iceland, at nearly 1,200. A large number of new post offices throughout the country are being planned at this moment to tighten the distribution net and better the services of the company. This article is issued from Wikipedia - version of the 2/15/2015. The text is available under the Creative Commons Attribution/Share Alike but additional terms may apply for the media files.